With thoughts of gratitude for the universe, country, teachers and parents, the memorial services prays for ancestors and f or the safety of family members by blanketing the whole mountain with 10,000 lit lanterns. Ikoma Grand Shrine Fire Festival. 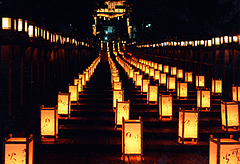 Known as the Fire Festival, the festival involves traditional shinto music, dancing processions and fire rituals. Home to the guardian deity of land, the shrine holds the festival every October, with its origins said to date back to the time of Emperor Tenmu. 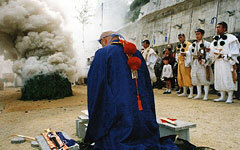 Parishioners of Ikoma valley are divided into 2 groups, standing and kneeling as they go through a variety of rituals. The two teams carrying "Omikoshi" (portable shrines) race to erect a large torch made of Japanese pampas grass. 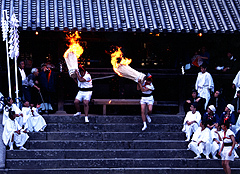 Due to the competitive dynamic of the festival, it is also fondly know as "The Dual Matsuri"
By the time the sun goes down, the festival reaches its climax with the fire ritual. Large torches are gradually set alight by participants running around with smaller lit torches, and when the large torches burn themselves out, the festival draws to a close. 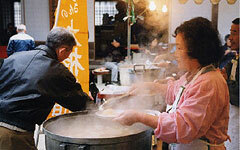 Copyright © 2014- Ikoma City Tourism Association. All rights reserved.